Visions of positive change that manifest into a reality. Following your heart leads you to a place of content, happiness and purpose. An inspiring book based on two soldiers of the Iran Iraq War written by Meredith May. Najah an Iraqi soldier left for dead was saved by Zahed a young Iranian medic soldier on the battle field. Both imprisoned as POW, both were claimed dead by their families, both held on to their dreams to a point of manifestation! One wonders after all the pain, fear, tears, lost and broken spirit how these two soldiers miraculously stayed alive and freed their way out of hell and into the hands of Canada’s haven. Twenty five years later, here in this beautiful city of Vancouver, the two soldiers find themselves sitting across from each other in the lobby of a non profit organization VAST (Vancouver Association of Survivors of Torture). Now the recollection of the past have been written….the untold story is now unfolded….in fact this story will give you renewed hope in humanity. An example of the power of positive change respectfully. 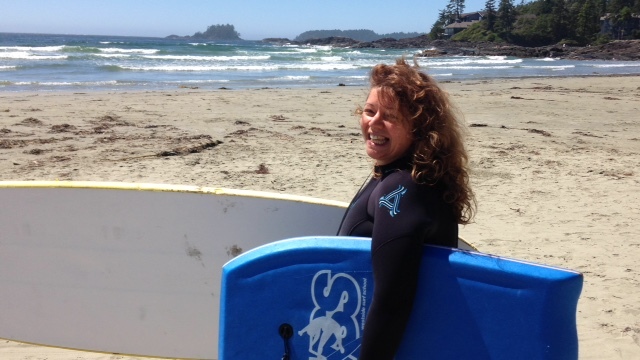 Surfing….who me…yes! I did it! We did it! The more power you create in your life the more it grows not only with oneself but with everyone you are connected with. It’s contagious…. energy flows …people are drawn to it and the more it grows the ripple effect gets bigger, like a wave and before you know it we are all in it together! Now isn’t that a beautiful vision!